We’d love your help. 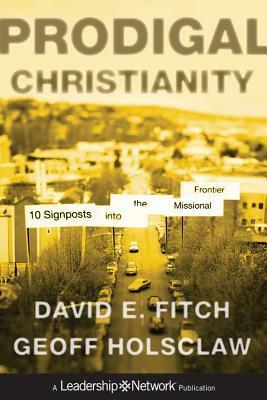 Let us know what’s wrong with this preview of Prodigal Christianity by David E. Fitch. To ask other readers questions about Prodigal Christianity, please sign up. While this book was more conservative than I expected, it was also more thought-provoking. Prodigal Christianity compares the journey of Jesus into our world to the prodigal son (obviously a little different take on that parable) and asks if our own Christianity is prodigal enough. The authors are talking about the missional frontier, and how we are spreading the Gospel. To become Christian is to learn to become prodigal. One quote on page 69 helped set the tone for me: “New Testament scholar E.G While this book was more conservative than I expected, it was also more thought-provoking. Prodigal Christianity compares the journey of Jesus into our world to the prodigal son (obviously a little different take on that parable) and asks if our own Christianity is prodigal enough. The authors are talking about the missional frontier, and how we are spreading the Gospel. To become Christian is to learn to become prodigal. The book’s humble introduction isn’t really indicative of what you’ll find inside. This really is intelligent writing and probing discussion. The experiences of the authors, planting their little Life of the Vine church near Chicago, are relevant and eye-opening. Which approach is best in a post-Christendom culture no longer dominated by guilt: presenting a (personal) “plan of salvation” or a (communal) “story of salvation?” Does a substitutionary view of atonement trivialize the Gospel, leading Christians to become preoccupied with the afterlife and treating day-to-day living as an afterthought? What does the Eucharist really mean in today’s world, in terms of welcoming outcasts to the dinner table? As a liberal Christian seeking common ground with my more conservative brethren, this is a book I can endorse. Luckily, it’s also an engaging read. First off, "prodigal," as defined by Mirriam-Webster, means, " characterized by profuse or wasteful expenditure." Thus, "Prodigal Christianity" would mean "wasteful Christianity." Of course, most people don't know the true meaning of the word and associate it only with the story of the Prodigal Son, thus extrapolating a meaning like, "given to leaving and returning." I thought, upon opening the book, that that was a good indicator of what I'd be getting: two writers who don't care enough to rese First off, "prodigal," as defined by Mirriam-Webster, means, " characterized by profuse or wasteful expenditure." Thus, "Prodigal Christianity" would mean "wasteful Christianity." Of course, most people don't know the true meaning of the word and associate it only with the story of the Prodigal Son, thus extrapolating a meaning like, "given to leaving and returning." I thought, upon opening the book, that that was a good indicator of what I'd be getting: two writers who don't care enough to research their title talking about a Christianity that travels into far-off lands and returns. It's actually worse than that. The writers acknowledge the true definition, then butcher it by saying that Christianity should be generous to the point of being wasteful to the non-Christian "far country" into which it "journeys." Again, "prodigal" means wasteful. It has an indelible negative connotation because it has a negative denotation. Pretending that's not true changes nothing. Obviously, most people won't get as hung up on that as this English major. There's more to disappoint, though. The first half of the book is basically a retelling of how the Christian religion works. -God sends Christians out into the world to make disciples. -We have scriptures we condsider holy and formative. -The most important message of the scriptures is the gospel. I really wonder who thought these reminders were necessary. Who is buying book with "Christianity" in the title and needing this much groundwork? To each his own, but it reads to me like filler. The second half of the book covers specific challenges the church now faces. The major issues are the question of homosexuality, how tightly to hold to the doctrines of Christianity (e.g.do we congratulate or castigate Rob Bell for dismissing Hell? ), and social justice. The format of these chapters is too offer a specific point of view that the author find too liberal, one that's too conservative, and then find that El Dorado, that Avalon, of a "happy medium." I don't think any of their arguments are convincing, simply because of this yearning for the Goldilocks solution. Also, I was surprised by how uncomfortable I was with their tendency to name writers who held these wrong views. They give Brian McLaren a lot of lumps for his ideas over the course of multiple chapters. I think those the authors will convince with their arguments will be just as quickly deprogrammed by the next book that comes along and says the oppostie. Anyone well-entrenched in the rightness of one side of the argument won't budge. So the book is half-filler and half an extended look at how great the writers' church is. Add to that some extremely clunky prose, both standard clunky and the clunky that only Christians can make, and the book loses most of its merit. I underlined a sentence early on that began, "Ten years ago (really twenty)..." How did this not get edited out? What's the point of saying two different numbers, one of which you say is "real"? There's also the Christian trap of using Christianese adjectives to make practices sound more mystical or transformative, which is to say, to make it seem like you got your money's worth buying this book rather than any other like it. They mention "Kingdom Prayer." They never mention any difference between "Kingdom Prayer" and the prayer you were told about when you first heard about Christianity. Thus, the adjective has no meaning and adds nothing.If you disagree with me, I ask that you give me the Kingdom Benefit of the Doubt. There is gold in this book. The stories of conversations with non-believers are illuminating and they get the mission inherent to the gospel, which is what Christianity (and the world) needs now. Still, most everything comes off as good or bad based on personal preference. Prodigal Christianity has great points about the nature of the church, but its tone and architecture seem off. It "proposes a way of being Christian: in missional communities who live in such a way that we invite the kingdom of God into our lives and the neighborhoods around us." And when it is on topic it is thoughtful and winsome. Unfortunately it spends too much time reacting to and critiquing the emergent and neo-Reformed. It has annoyed the emergent and while I have little sympathy with the Prodigal Christianity has great points about the nature of the church, but its tone and architecture seem off. It "proposes a way of being Christian: in missional communities who live in such a way that we invite the kingdom of God into our lives and the neighborhoods around us." And when it is on topic it is thoughtful and winsome. Unfortunately it spends too much time reacting to and critiquing the emergent and neo-Reformed. It has annoyed the emergent and while I have little sympathy with their whining over it, even unsympathetic me sees why they are annoyed. The neo-Reformed are fairly insular and probably have not noticed yet, especially as the tone with them seems gentler (and what is with using the ESV?). Prodigal and its use throughout also seems gimmicky, like "Desiring God", but probably not as catchy. I understand its origins in Barth, but every time I picked up the book again I had to refresh what they meant by it. And the book really could use some better examples. They did provide excellent summaries and repeatedly tied the ideas of separate chapters together into a compelling story. So, all that said, the ideas are good and challenging, especially the idea of incarnating as the church the message of the gospel. The authors want Christians and the church to operate differently, assuming post-Christendom and going out into the world as the church. Scot McKnight in his book "The King Jesus Gospel" describes a deeper, fuller, more robust idea of the gospel that goes beyond simply "get saved". What McKnight did for reimagining the gospel, Fitch and Holsclaw have done for ecclesiology and mission in "Prodigal Christianity"
This powerful (and potentially controversial) book challenges the de facto responses to the post-Christendom and post-modern reactions to Christianity in the west and describes "signposts" to lead the church into this strang Scot McKnight in his book "The King Jesus Gospel" describes a deeper, fuller, more robust idea of the gospel that goes beyond simply "get saved". What McKnight did for reimagining the gospel, Fitch and Holsclaw have done for ecclesiology and mission in "Prodigal Christianity"
This powerful (and potentially controversial) book challenges the de facto responses to the post-Christendom and post-modern reactions to Christianity in the west and describes "signposts" to lead the church into this strange new world, following the "prodigal God". The authors don't claim specific answers, nor do they claim a particular program for churches to follow. They instead describe life lived prodigally, upending assumptions and reimagining the church in our western culture. Dr. Fitch, at my commencement from seminary, admonished us not to preach "nice" sermons. In a later blog post, he told people to be a "destroyer of worlds". Fitch brings his protege, Holsclaw, along with him as they certainly don't present "nice" answers and most definitely destroy the worlds we create in our churches. Not everyone will welcome this book. From one side, people will claim it doesn't declare truth strongly enough and enters a very wishy-washy gospel and ecclesiology. From the other side, the authors will be accused of a new legalism and separatist conservatism coupled with too much of an "exclusivist" theology. To me, a follower of A Third Way myself, I found this book to thread that delicate way of living in relationship to the incarnational Christ while still being primely positioned to bring God's Kingdom bear in this world. This is a book which attempts to present a winsome Christianity to a post-Christendom world. The last two chapters on justice and pluralism are the best two chapters in the book. Also helpful is their critique of Brian MacLaren's New Kind of Christianity. Fitch and Holsclaw write engagingly about the importance of hermeneutics. However, their own ability in this area is quite weak. One cringes at how they interpret texts such as 1 Corinthians 5 and Acts 15 on the Jerusalem Council. Fitch and Ho This is a book which attempts to present a winsome Christianity to a post-Christendom world. The last two chapters on justice and pluralism are the best two chapters in the book. Also helpful is their critique of Brian MacLaren's New Kind of Christianity. As a so-called Neo-Reformed Christian, I enjoyed this book for its practical help in entering the missional frontier. The emphasis on the local and relational is refreshing. I wish authors exercised the principle of charity in critiquing 'my camp'. Often I would read the critiques of Keller and Carson and just shake my head as I know that such a reductionistic presentation of those men wasn't helpful. Often, the 'prodigal' way is preached and promoted by the Kellers of the Neo-Reformed world. So, I don't think much of what Fitch and Holsclaw suggest is unique to the Neo-Anabaptist tradition. A helpful book for the Christian pilgrim. That it was difficult to process reveals more of my own intellectual deficiencies than the organization of the book. Readers will be drawn to the frequent examples of personal witness by deeds thus enlarging the work of God in His world. They may be dismayed by the echoes of orthodoxy that appear here and there. It is difficult to escape the gravity field of traditional recent Christianity even as the new trajectories are explored. Prodigal Christianity was really challenging for me. As someone who grew up with a conservative, apologetic ideology but is also dissatisfied with both Christian liberalism and emergent church, it spoke to me. It gives us a way forward that seeks faithfulness beyond commitment to an ideology and renewed commitment to living the gospel in our neighborhoods. It was a good, challenging, and encouraging read. Not a bad read, but nothing really groundbreaking by any stretch. Much of the same has been included in other works on missional church stuff. For folks new to the idea of missional church it will likely prove helpful. Worth a read, but it is one additional voice among many encouraging similar approaches. Won't be appreciated by all of course, as it does push a few buttons on issues of the church's relationship with people of "alternative sexualities" (not my terminology of choice). I don't do huge book reviews, but this was very well thought out theologically and went out of it's way to speak well of alternate viewpoints. That being said, I loved that Fitch gives us a middle path between the pompous theology police of the neo-reformed (The Gospel Inquisition! I mean collation) and the sometimes murky orthodoxy of the emergent movement. This is a good, but deep, read. The author makes the point that the culture is post-Christian. His argument is good and he offers some good suggestions for the way forward. We have to learn to ask different questions and really listen to culture to do so. I found that Fitch and Holsclaw gave voice to some of my own thinking over the past few years about mission, especially missio dei. Thus they will be allies as I go forward as I'm led by the Spirit to discern God's mission in this place. An important work that I will keep coming back to, and keep bringing my church spheres of influence back to. Great book with a good mix of theology and practicality. David Fitch is B. R. Lindner Chair of Evangelical Theology at Northern Seminary Chicago, IL. He's married to Rae Ann and they have one child, a son Max. He's pastored and participated in many church plants including Life on the Vine Christian Community a missional church in the Northwest Suburbs of Chicago of the Christian and Missionary Alliance. Most recently he and his family have joined Peace David Fitch is B. R. Lindner Chair of Evangelical Theology at Northern Seminary Chicago, IL. He's married to Rae Ann and they have one child, a son Max. He's pastored and participated in many church plants including Life on the Vine Christian Community a missional church in the Northwest Suburbs of Chicago of the Christian and Missionary Alliance. Most recently he and his family have joined Peace of Christ Church, Westmont, a church planted from Life on the Vine. He writes on the issues the local church must face in Mission including cultural engagement, leadership and theology. His theology combines Neo-Anabaptist streams of thought, his commitments to evangelicalism and his love for political theory. He has lectured and presented on these topics at many seminaries, graduate schools, denominational gatherings and conferences. Dr. Fitch is the author of numerous articles in places like Christianity Today, The Other Journal, Missiology Evangelical Missions Quarterly, as well as academic journals. He has been featured in places like OutReach Magazine, Anabaptist Witness, Homebrewed Christianity.